Hi, I just took my first spiritual bath yesterday, and after taking the bath I have got some problems. I feel quite silly for my questions, but I really do hope knowing how others handle the case. I took reconciliation bath, and after the bath, I found something is red and sticky, stick on my skin, my hair and my bath tub, and now my hands look dirty, it's hard to remove. In fact can I clean it? My rootworker suggests me to take the bath in the morning when I wake up, for some reasons, I took my bath yesterday night, and I wash my hair today morning, so that I wash away those herbs, I plan to take my 2nd bath in the morning before I go for work, but...em...I don't know how to deal with the herbs and sticky thing stick on my hair. Yes you can clean yourself after you have taken the bath. Its not like you are washing away anything or the essence of the reconciliation bath. Now what I like to do is put the bath crystals in a strainer, and then pour hot water over the herbs, and then strain the into a bowl. That way it takes out the herbs. I think take a sponge or towel, and then bath upwards since this is something you are trying to draw to you. OR I put the mixture into a spray bottle, and then spray it on me, and spray it up my body. If I need to clean myself again, I need to air dry myself first, right? I can't take another bath right after my spiritual bath, right? Your question is not clear; you take a spiritual bath first than air dry, do not take a bath for the sake of bathing. You will remove your ritual work. I am sorry for my question is not clear. There is language barrier...>_< sorry for my broken English. Because after the spiritual bath, I found something sticky are on my skin and hair also herbs are there, I would like to know if I can take spirituaI but avoid herbs and something which is sticky left on my skin. Now, there are still some sticky red marks on my hands... Or it's normal for my case, I mean it's normal for there is something stick on my skin? You maybe allergic to something it sounds anyway 'some sticky red marks on hand' ...if this is not the case, follow starsnthesky7's advice above, use a strainer to catch herbs before taking your bath. Strain the herbs. You want to get enough of the herbal bath into the water without everything in the mix in the water. Does that make sense? Follow the instructions whatever they might be, and air dry afterwards-- no towel. You can absolutely strain out the herbs from a wash if you don't want them to get in your hair and what not. However, do not take a bath immediately after your spiritual bath. I had a favorable reading with an AIRR member and am going to be doing reconciliation work. Any recommendations for a reconciliation floor wash? Hello - I want to perform the Reconciliation bath whilst reciting the 32nd Psalm for forgiveness. The ritual says to gather a small amount of the bath water and pour a small amount leading up to my door. I would like to know, can I also pour a small amount in front of the door of the person I wish to reconcile with? I can't get to his door directly but I could pour it in along the gate door he passes through. Would that be helpful? Take the bath and when done scoop a nice size cup of it. Then start as close as possible to him ( if you can only get to the gate then start their). Not sure how far it is to your house from his but every interval ( street light, or major street, or mile, high way exit..depends on distance which one you use) pour a little out till you reach your home and pour the remainder. The idea is that you are leading him from his house to your door step. I love that idea. Thank you! He actually lives quite a distance from me but I could easily do this. I would probably do it in the middle of the night so I won't have to worry about anyone noticing my repeatedly opening my car door to pour some of the water lol. Thanks again! Pour it out the window its less noticeable. I would do it late at night as well, less likely you would be seen, you will feel more confident. I would do it after 12 am though as then then the sun its technically rising. Yes, it would definitely be done after 12 am - probably something around 4 am. I my order arrives soon! Please clarify something for me. 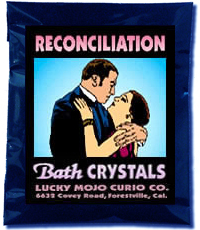 I'm reading the spell to do with these Reconcilliation Bath Crystals saying the 23rd Psalm. The directions say Repeat for a total of three days, a total of three baths and nine recitations of the Psalms). I keep reading the directions and it says to say the 23rd Psalm while mixing the crystals with the water and then again while pouring the water over me. When would I recite it again? I've read it over and over and I can't figure it out. I'm sorry for the question but, I wanted to do this and want to make sure I do it correctly. Any advice is appreciated. It is actually Psalms 32 and not Psalms 23. Upon further reading the work listed on the Reconciliation Page I do see that there are two times it suggest praying Psalms 32. Though when I had first read it I literally saw it on the page to pray Psalms 32 while pouring the mixture over you--that is before you say it again while rinsing with clean water. Hopefully we can get some clarity on this, and make any proper adjustments on the page. Not a problem at all! Wanted to make sure you were going to be saying the right one. Thanks kylady and Papa Newt for pointing out that the third ceitation of Psalms 32 was not specifically noted. It happens when you dispose of the water! I have updated the page to explain this better. Thank you very much for clearing this up for me Catherine. Now I can begin. Catherine, I'm sorry but, i still don't see where you recite the Psalm when disposing of the water. I am looking on the Reconciliation spell page. Maybe I'm looking at the wrong place. I'm planning on doing a 7 day reconciliation spell myself. and It requires taking spiritual bath every morning before sunrise. So after I take spiritual bath and air dry, can I wash myself again later in that day? Also, should I light the candle right after I take spiritual bath? I planned on lighting the candle at the venus hour though. I always suggest taking a regular shower prior to taking a spiritual bath. Hi Miss Aida, Thanks for the info. 1) even though it's a 7-day spell, can I just take the spiritual bath on the first and last day, and not each day? 2) can I start the reconciliation spell on Sunday, not friday? 3) can I blow dry my hair after ? Yes, you can bathe the first and last day. That's fine. You can start whatever day you want. Many rootworkers don't follow days of the week, moon phases, planetary hours, etc. Yes, you can blow dry your hair.